Aphex Twin is a British musician who is often credited as one of the biggest figures in contemporary electronic music with his pioneering works in ambient music and intelligent dance music. He began his career in the 1980s and has since risen to be regarded as one of the best in what he does. Beyond just music, Aphex is a highly mysterious person who has got a lot of myths and legends surrounding him. Nonetheless, it is still his music that stands him out from the crowd. Although he is very popular as Aphex Twin, the musician was born Richard David James in Limerick, Ireland on 18 August 1971. He was, however, brought up in the county of Cornwall in South West England in the United Kingdom. Both of his parents, Lorna James and Derek James are Welsh and they brought him up in a very happy home together with his two older sisters. He also had an older brother, also named Richard James, who died at birth. It is in his honor that the singer adopted the name Twin in his stage name. His love for music has sustained since he was very young and it is thanks to this that he started producing music when he was only 12. Before then, he would buy different albums and experiment on the family’s piano. He got his education in Redruth, Cornwell from Redruth School. While he was there, he came up with a program that allowed him to generate a sound on Sinclair ZX81, which typically has no sound. 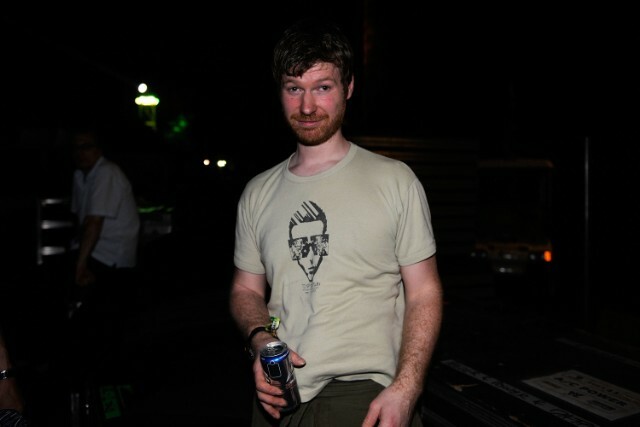 As he continued working on his music, Aphex Twin founded the Rephlex Records together with Grant Wilson-Claridge. He began his career as AFX a name that he has continued to use through the year. Aphex released his first EP Analogue Bubblebath Vol I under the name AFX in 1991. It was followed by Analog Bubblebath Vol 2 in the same year. As Aphex Twin, he released his debut studio album Selected Ambient Works 85–92 in 1992, the same year he released his Digeridoo and Xylem Tube EPs. A very hard working musician, he has already released 10 studio albums, 7 compilation albums, and 41 extended plays. His most recent album, Syro, was released in 2014 while his most recent EP, Collapse, was released in 2018. Aphex Twin is a family man. He is married to Anastasia Rybina. Just as it is with the singer, there is very little that is known about his wife because she is also rather mysterious. While it is not known for how long the two have been together, it is known that they have been blessed with children. His children are still very young but they have already started showing interest in music. Already, one of his children who is only five has a Bandcamp page where he has published some music that he made using Renoise. According to the father, the kid is doing things that he finds very hard to believe with music even though the only thing he taught him is how to record his voice and other smaller things. In the build-up to the release of Syro, the electronic singer revealed that his wife, parents, and children all feature in the album although one may find it hard to tell because their voices are all masked. As regards his net worth, Aphex Twin is worth over $12 million. He made a larger part of his fortune from his career as a musician. 1. Aphex Twin has won a number of awards in his career thus far such as Prix Ars Electronica, NME Awards, Rober Awards Music Poll, and A2IM Libera Awards. In 2015, he went home with a Grammy for his sixth studio album, Syro, which was named the Best Dance/Electronica Album. 2. As a little child, he was considered a prodigy who could do may crazy things. He could play the piano using only the wires from the inside. More so, as stated, he started producing music when he was just 12. 3. Aphix can perform for any event whether the crowd is large or small as far as it is in London. He sometimes goes to such events, even the small ones with a tour bus. 4. Aphex Twin is a lover of military gadgets including helicopters, submarines, tanks, and many others. He owns a Daimler Ferret Mark 3 Armoured Scout Car which is very similar to a tank. In fact, people have confused it to a real tank.